Well, here we are at the beginning of another month! As usual, I'm going to share my report for the previous month, but I'm trying something a bit different this time. 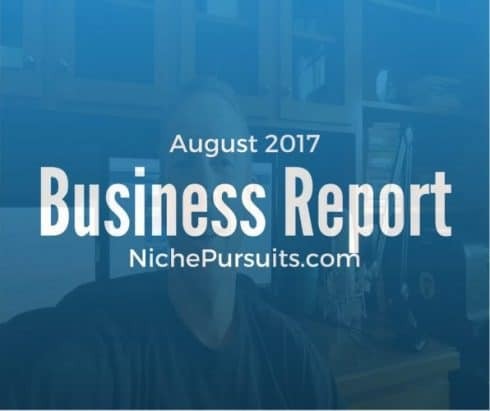 For the most part this year, I've been sharing detailed income reports where I reveal the exact numbers of my business. However, I'm no longer going to do that. I have 2 reasons. First, I've mentioned a few times that its a little awkward revealing income numbers when you have family and friends reading. I have some more interaction based on my income reports recently with family and friends and well, it's still awkward. Sure, I have some businesses doing pretty good, but when Pat post's numbers of $320,000 in one month it definitely didn't inspire me. All I noticed was a huge gap from where I was and where he was. (And by the way, Matt Paulson wrote a great article this week about why he stopped trying to be the next Pat Flynn). Even though I'm miles away from $320,000 a month, I don't want my income numbers to demotivate anyone reading them. Sure, it's fun to see income reports of people making a couple thousand a month or a little more. But $10,000 or $20,000 a month can seem so far away for some people that it makes them feel like everything they are doing is completely useless. I don't want people to feel that way after reading my reports. Coupled with the fact that sometimes I have awkward interactions with people I know about my income reports, I will simply forgo the actual income numbers. The main reason I want to still do an overall monthly report (without income revealed) is to share with you the lessons I've learned in the previous month and hopefully provide you with something you can take away and apply to your own business. The secondary reason is that reflecting on the previous month is good for me to keep me on track and helps me plan for improvements. Even though I won't be revealing my income numbers, I still will be revealing my pearly whites each month. In fact, I have something special that is brand new this month…a video! That's right, I'm doing a short video of myself each month from now on; in addition to the picture. I only get one take on the video. I have to take a picture of myself (my monthly selfie) while I'm recording the video. I'll briefly share what the latest news is for my business. Video length less than 3 mins. And the “selfie” that I took while recording that video is on display below. Overall, I'm excited to share a couple of big updates to my business; including selling one business and starting a new software business. A couple of weeks ago, I wrote about weighing the pros and cons of selling a business. As you may have read in that post, I've decided to sell my Niche Site + Amazon FBA business. In fact, I'm happy to report that I'm working with EmpireFlippers.com to sell my business. You can see the listing for my business right here. If you are interested in buying the business, please go through the normal Empire Flippers process (rather than contacting me privately). This is the business that I've been documenting on and off for quite some time here and here. I started this business basically on a whim in 2015 to see what I could do in the Amazon FBA space. I quickly saw that my first couple of products were doing well, so I built up a niche site to support that brand. Now that niche site ranks in Google for hundreds of long tail keywords. And when the visitor lands on my niche site, I very often end up sending them to my Amazon FBA listings to buy my products. So, not only do I get lots of natural sales on Amazon.com, but I've built up a completely separate traffic source from my own website that helps stabilize the business. 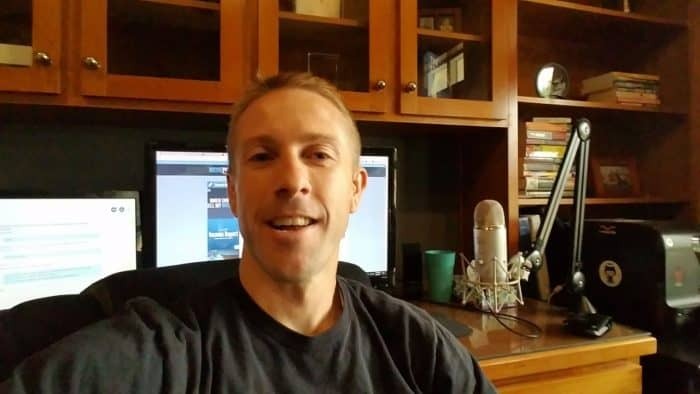 This entire Niche Site combined with an Amazon FBA business is really a killer strategy. It's worked well for me and I know Jon Haver does something similar as well. Because it's worked so well for me, I already have another Niche Site + Amazon FBA business that is showing some real traction. (This is my “Fitness Brand” that I've referred to in previous income reports). Overall, selling this business will allow me to cash in (obviously) but also free up some of my focus to pursue my next big venture…which is software! Starting a New Software Business! I sold Long Tail Pro about a year and a half ago. When I sold the business, I promised myself that I would wait at least a year before launching another software product. I just wanted to take some time off and really think things through before I jumped into something new. However, the time has finally come to share what I've been working on behind the scenes for a few months! 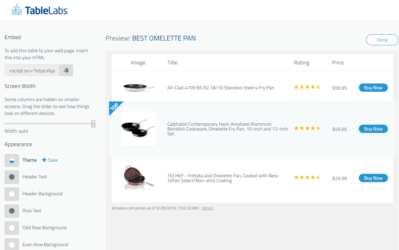 My new software tool will help you create beautiful product comparison charts for Amazon Associates in just a few minutes. I know this is something that I've wanted for a very long time, and I've just never been satisfied with the time intensive options like Table Press or even Thrive Themes. So, I finally took the step of hiring a developer to built out my idea and it's finally come to fruition! I don't have much else to say about the product at this point; however, I will let you see an example. Below is a chart that I created in less than 5 minutes from start to finish (4 mins and 28 secs to be exact). Yes, my Amazon associates code is automatically inserted so whether you click on the image, title, or buy button I will get credit for the sale (should you buy). Yes, everything including images and price is pulled in via the Amazon API so it's 100% compliant and updates automatically. Yes, I can quickly and easily change the way the chart looks and rearrange columns or rows in an easy to use web-based platform. Anyway, there is a ton more that I could talk about here. But just know that I'm VERY excited about it! 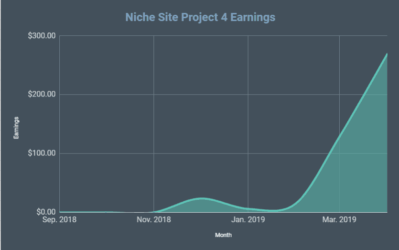 In fact, Jake and I have been using it on some of our websites for the past few weeks and are seeing significant increases in earnings because we are able to quickly add these charts to pages that we never added charts too before (it was too time consuming). I'll share more details in the next couple of weeks. Overall, what do you think of the idea and how it looks? Even though I'm no longer sharing specific numbers for my brands, I do want to share any brief highlights or lessons that I may have learned throughout the month. Niche Pursuits Insider is still going strong. I've decided to open the doors in an “evergreen” way (doors always open) and focus on driving traffic through FB ads mostly; rather than emailing my list a bunch of times. We'll see how that strategy goes over the next couple of months. Other than that, Jason is helping out with content here on the site and making sure we have a good content plan in place. This business had a growth month for August and September is looking solid. However, I may not have this business much longer since I'm selling it on Empire Flippers here. This Niche Site + Amazon FBA business I think will be my next big business. This brand grew by 55% in August. I could and probably should write an entire blog post about this brand. We tried a Kickstarter campaign and it did not go well. I feel like we did a lot of things right; however, at the end of the day I just don't think the product was a good fit to be launched on Kickstarter. We have since launched the product on Amazon and its doing MUCH better. We are still very early on with sales, but right now it's already ranking on the first page of Amazon for one its targeted keywords (thanks to some promotions we've been running this week). If this product can stick on the first page, it will be a great product. I also have a second product that just went live under this brand as well (physical product on Amazon). We've made some initial sales and got a solid first review. However, we've yet to employ the same “launch” strategies via discounts like we have on the first product. I think with a little bit of promotion on Amazon, we can turn this second new product into a solid earner as well. The category is competitive with lots of sales (top earners doing $30k+ per month). However, we have a unique feature that helps us stand out a bit from the competition. Hopefully this will help us attract some sales long term. Finally, some of our “older” existing products are picking up in this category. I don't know if it's just seasonal or what, but sales have definitely picked up the last few weeks for some of our existing products. Overall, I'm very excited about where this brand is going. These products as a whole (about 14 products) decreased by 14% in August. I've decided to look at some of the older products and see if we can improve the listings, do some promotions, and improve sales. When we launched these products, many of them were done in a very MVP fashion. The pictures were taken with mobile phones and we just put the listings up to see what kind of sales we could get. Believe it or not, this has been good enough to do fairly well. However, the time has come for me to finally go back and do a complete listings audit to figure out how we can get better pictures and make our listings stand out. I've created a complete listings audit checklist that Jake is helping me go through with each product. Once our listings are optimized, I plan to do some promotions via discounts to generate sales and hopefully a few more positive reviews. I feel like we have a few products that are good, but the listings need to be “dusted off” a bit and re-launched. I'm hoping to see a nice bump in sales by the end of the year. After having our first booth at a tradeshow in July, I was hoping to see big growth numbers during August. Unfortunately, that hasn't quite worked out. Some of our Facebook ads haven't been performing as well, and we didn't receive as many retail orders as we had hoped. Part of the reason for slow retail orders is because we have been hesitant about pushing this avenue too hard since we are low on inventory. We don't want to have a bunch of orders come in when we aren't ready to fulfill those. However, we are in the process getting new inventory in stock and should be able to hit our retail sales process much harder in September. (Our process involves contacting those we met at the tradeshow and reaching our via email to retail stores across the country). Overall, I'm still enthusiastic about this brand and expect continued growth. Overall, I hope you don't mind that I've changed up my business report a bit. 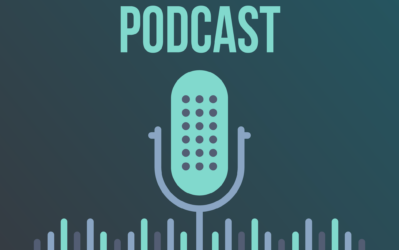 Hopefully as I continue to share what I'm working on I can still help you stay motivated in your own business as I share what's working for me. This is also a huge month for me since I just listed a significant business for sale and I'm about ready to start what I hope will be a significant software business. Want to hear more? Let me know in the comments below. Thanks! I’ll be first in line for that Comparison chart. This thing has been needed for a long time! Good call. When can I buy it? Thanks Dave! It’s not quite ready for sale yet, give me a few more weeks :). As long as you are on my email list, I’ll make sure you know where to buy. Comparison Chart sounds awesome. I’ve been looking for a year for a really good tool but stuck with Table Press as I haven’t found anything I’m really happy with. I’m ready to buy! Yep, I’ve been in the same boat for years – stuck with time consuming options like Table Press. Glad you like it! Way to go, Spencer! Must say, I really look up to you in this space and am motivated by you as a mover-and-shaker, so to speak. Trust your direction and business decision-making. Always moving projects forward, developing new ones and solving problems, while adding value to those whole follow along the journey. Ps, doesn’t matter if you put the exact figures up or not (…we know you’re doin’ it big)! Congrats on the listing and hope you get asking price or more. Cheers! Thanks Mike, your feedback through beta testing has been valuable! Good One Spencer, would to use it in future projects. i already subscribe i think i;m getting email when plugin launch. Yes, I’m looking forward to seeing this too. 1] make clicking on the buy button put the item in their cart so we get a 90-day Amazon cookie. 2] ability to change the color of the table. 2. You can already do this. How is this a “comparison” chart? Can we change the color background, button, etc? Yes, you can have several styles/colors of charts. This is just 1 example. I totally respect your decision! But your income report where of great inspiration to me. Sure I am no way near you in terms of income – but I am working to get there. Seeing your reports – ups and downs – has made me want it even more – because you showed that it could be done. Someone graduated at the age of 22, but waited 5 years before securing a good job! In conclusion don’t rush to get and don’t be sad . How soon are going you going to launch it for access? Thanks Kemmy! I expect to launch in a few weeks; probably early October. I agree, Spencer. You don’t really need to show your actual numbers to create those reports. You just need to mention what strategies are and aren’t working. I have to say that I’ve been playing a bit lately with comparison charts. I wasn’t happy with how the plugins I’ve tried handle responsiveness and decided to put my developer hat on and fix it myself. I don’t think I’ll be your competitor, though. 🙂 I just think mobile users should have the same good user experience as desktop users. Question: With 14 “incubated” brands, isn’t that a heck of a lot of work with importing logistics etc that you have to deal with? Or did you just import once and inventory has not been used? Count me in too for comparison chart. Hi Spencer, been a long time lurker but in the last few months have actually taken action and started building my niche site portfolio. Currently got two sites with growth going really well and maybe in the future looking to get into FBA. But niche sites themselves are such a steep learning curb; I think its important not to rush into too many ventures and not be able to focus. Your content is so inspiring. Will be in the que for the new comparison chart. Brilliant report as usual. 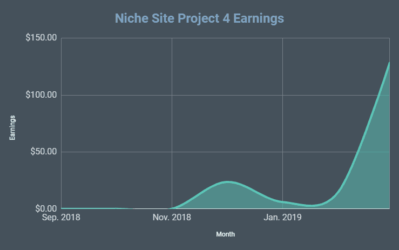 Sharing income reports can be motivating when you are just starting out but I agree sharing Big numbers can distance you from your audience and demotivate alot of people. I’m definitely interested in the chat. Unfortunately your website on empire flippers is out of my league (at the moment). Awesome post, I like the change with not showing your income. Can’t wait for the new comparison table plugin. I’m guessing it’s going to be a plugin. Love your post, are you guys ever going to open internships again? Thanks Jamina, I don’t have any plans at the moment to do internships again. The software business is a really great idea. My one friend is also doing software business. Main problems in this business are miss use of licenses and distribute is free. Congrats on listing. All the best in finding a buyer! I’m wondering if you recommend 1) people to start FBA businesses today and 2) A specific theme for blogs that support FBA businesses. Honestly, I think either route can work. It just depends on if you have the money to invest in creating a product. great comparison chart def is a missing thing on the market! thrive themes does a good job but they have a major flaw: responsiveness..
and as I’m reading your post on my iPhone 5S now, I can tell that so far, yours too 🙂 and I’d love to see a proper responsive chart! lately soft like ClickFunnela or Thrive Thenes have been adding the possibility to display or not certain elements on mobile, desktop or tablet. sounds like a must for me, but also a proper organization of datas so mobile display does not cramp everything all together as it shows now on your charts. looking forward to checking out the final version! Agree with the income report decision. I wouldn’t feel very comfortable either. IRS must keep an eye on you…lol. Very excited about your new project. You’ll put Tablepress out of business. Count me in. Keep up the good work and low key approach. I agree about earnings being demotivating to see. I actually don’t find pat Flynn stuff that helpful nowadays but is great at marketing his brand. Responsive tables won’t be cool. I use go pricing tables which I like. (Popular on code canyon). Do you have a post about your fba new product launch process? That is my biggest issue, getting traction on new products. Thanks Brian, good to know I’m not the only one with a similar opinion on the income reports. I don’t have a post on my process for FBA. Basically, run a promotion for a certain number of units you think it will take to rank well, then hope it starts selling a full price. You’re calling your comparison table project ‘software’ – but I’m assuming it’s going to be a WordPress plugin? Hoping the entire thing will be completely customizable. Meaning, all colors, fonts, sizes, etc can be customized 100%. Also – hover effects would be great. At a minimum, being able to change colors on hover. Lastly, mobile responsive is a must these days. If all of that stuff is included in this plugin – you’re going to have another massive hit on your hands. Probably not as big as Long Tail Pro was… but if you truly make the very best comparison table plugin, it will sell like hotcakes. Thanks Matt! No, the table project is not a wordpress plugin, but a full web based app. 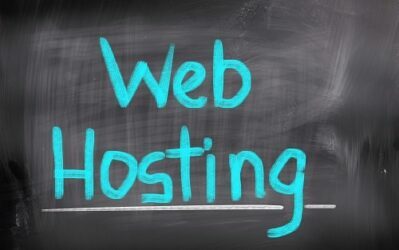 You will create and manage all your tables (no matter what domain the tables “live” on) from a web based portal. You will also have a management dashboard showing all the stats from your tables (views, clicks, and more). So, it really it a full blown application. So, it won’t matter if your website is WordPress, Shopify, html, or anything else, these tables will work for your site. Eventually the plan is to have everything 100% customizable, even though it won’t be that way with the first version. Oh wow! Maybe this thing does have potential to be (almost) as big as LTP was for you, then, if you’re not limiting yourself to just WordPress sites. Which opens up the possibility for a potential WordPress plugin to accompany the software at some point in the future! Good luck! I’ll be interested to see how this thing works when it comes out. Definitely. There could be a wordpress plugin to accompany the software in the future, just depends. Thanks! Great idea on that comparison chart Spencer. And I really enjoyed the income report. Thank you! Thank you Spencer for sharing this post. It really help me and a lot of people to think out of the box. Thanks for sharing your strategy. The comparison table plugin is a great idea. Especially when it updates the price automatically. I would check out if there’s a way to make it look good on mobile phones. Because it’s like more than 50% browse your sites on it. I’m looking forever for a good solution which is very hard to find. Thanks! The tables are already mobile responsive. Honestly, I’m quite sad to hear the you’re firing the Income reports. Unlike you, Spencer, for me to read other blogger’s income reports is a very inspiring thing. My income is miles away from what you’re earning, but every month I’m coming to see your income reports (and Patt Flynn’s too) just to get more motivation to work harder on my projects. You were and example, that all these numbers can be achieved and everything what I have to do is just don’t stop working on it. Like your new idea for amazon comparison table.I also do not like much table press so preferred custom tables in my websites. But will sure buy sure new plugin as soon it ready for it. How can i get launch date or as soon launch notification. You are really doing great. And since I am in the business of creating amazon niche sites. I am so interested in the tablepress. I was wondering if the rating and $$ is amazon compliant until I saw it is automatically updated! Genius! Yes, everything is 100% Amazon compliant. Prices, images, and everything else is via the Amazon API and will update automatically :). Personally, I am motivated to know that if I can just be about 1/10 as successful as the pros then I can make $10k/month which is the current goal. The bigger numbers make me feel better as I know with work I can get closer to replicating. I suppose it is all mindset though. Thanks Dave, I’ll keep that in mind. I am a newbie to this new software, but honestly it is very good !! Thanks for sharing this great software !! Great progress and I would like to add few points on your product idea. Thanks for the thoughts, Naveen! Some of these ideas are already implemented and others are things we can look into doing. Thanks! This is something always motivating me to do blogging seriously. After reading your few blog post I have made two niche site. I follow your niche site link building technique. After 3months I am making $10+ per day. I love going through your monthly income. It is still motivating even if you have removed the actual figures. I look forward to working with the comparison table software in the near future. Nice report. I’m looking for a day I will definitely upgrade my monthly revenue by 6 figure. You are really doing great. Like your new idea for Amazon comparison table. Thanks for sharing. Thanks for another excellent update, Spencer. I never did like the Income Reports much but assumed that was just a cultural difference. Good for you for stopping something you weren’t comfortable with. Love your willingness to share your secrets and this is why all the good wishes and prayers of those who benefit from you are boosting your earnings as well.